The entrance to the Church of the Nativity in Bethlehem is small, one has to bend. There is only one place to plant your foot as you step over the threshold. That stone is worn by the millions of feet that have taken that step. Some power in that. One of the HUGE advantages of coming at this time of year is the thin crowds. Last visit we waited three hours to get in; this time we walked in, investigated the massive renovations the church is undergoing,viewed the frescoes discovered beneath the floor that date from the time of Helena, Constantine’s mother and then headed downstairs to the birth cave. The cave accommodated our entire group. Once again – as at Emmaus – music was the catalyst. Eyes moistened as “Away in a Manger,” “Gloria in Excelsios Deo” and other offerings flowed from us. The sense of reverence lingered after the music stopped. 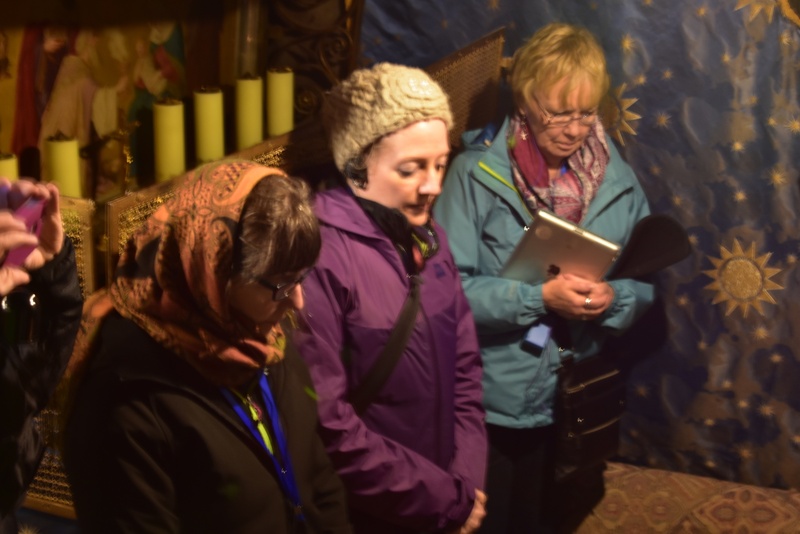 I do not think that any in the group cared if this was the exact spot in which Mary birthed Jesus or attributed any magic to the silver star marking the site. Somehow “close” was more than enough for the imagination and the heart.